I was just wondering if anyone uses MT4 with either a demo or Live IG account? I'm having trouble downloading historical data from either of these accounts. Strangely when I go to a demo CFD account the data downloads no problem at all. Has anyone seen a problem here? If you are using an MT4 spread betting account I'd love to hear from you. If the dat isn't there is there another source of historical data I can use? If you are seeing the 'no more data available' sign make sure none of the time frames are greyed out, go through and double click them all so they are all green/yellow then check the monthly again to see if if goes back to 1997. Thanks for the reply again! I'm slowly getting to grips with things. It's very strange. Yes I've tried that. I can only get 5 min data back to 2 Jan 2019. 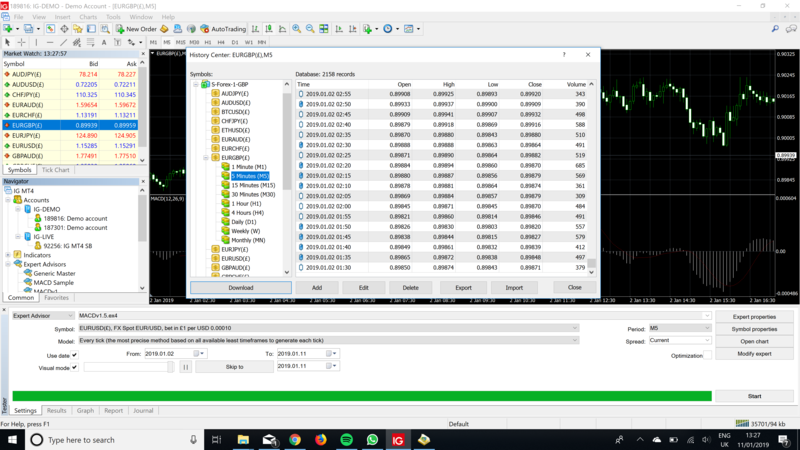 Yes that is correct, in metaquotes the data is packaged in the time frames (IG do the same) so that the 5 min chart data only goes back about 2048 units which is to the beginning of 2019. Step up to 1 hour and 2048 units goes back to mid 2018, daily goes back to 2012 and so on. It's the same as the actual charts, the 5 min chart will only scroll back to Dec 2018. So to go further back you need to open the higher time frames. The message is saying there is no new data to download yet (you already have all that is currently available). ive logged a query with IG and they are looking into it. The chap over the phone wasn’t making much sense to me and I don’t know why the CFD and SB would be different? Interesting, I don't have a cfd account but let us know how you got on. @Caseynotes so when you go to the 5 minute data how far does it go back in time? @EdFuk, it's looks to be different for each asset as well as different asset classes so on the 5 min eurgbp it's 2019.01.02 while eurusd it's 2018.07.25 and Ger 30 it's 2018.07.02. Right, that's the same in my program. When you click on Download does it say that there are no new data? If this is the case how are you meant to back test a strategy for any decent period of time? Thanks Casey. Very helpful as always. Hi Guys, I've just registered for a MT4 spread bet acccount. I'm just wondering what kind of margins to expect as the position sizing is a bit different to the regular MT trading. I believe you are bidding £1 per 0.00010 of currency and than you choose the volume. In my demo account I have 8 positions opened all with volume of 0.5 and my margin requirements are £76??? Would that be the same under the new EU legislation in a live account? Hi Stefan, sounds like you might be a decimal point out there. The margin is easy to look up on the online platform demo because it's worked out for you, so for fx a £0.5 size on eurusd the margin requirement comes in around £188 for just one position. On the mt4 order ticket the size is called volume, on the spread bet mt4 account it means £/point. I think the decimal point shifts depending on what asset class you are trading and I haven't used it for fx. Pays to have a play on demo to fine tune it.